Lakeside Dining Hall | LTI, Inc.
LTI, Inc. | Changing how food is served. 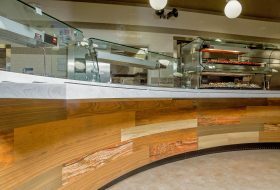 In partnership with Foodesign Associates and Dixie Store Fixtures and Sales Co, Inc., LTI helped transform the Lakeside Dining Hall at the University of Alabama in Tuscaloosa. 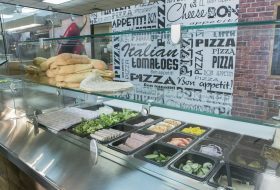 The goal of the project was to completely renovate the centrally located freshman dining hall by adding individually-branded serving stations that enhance the dining atmosphere, support better traffic flow and increase the number of total diners. The project also included a second story mezzanine that would act as additional retail space. 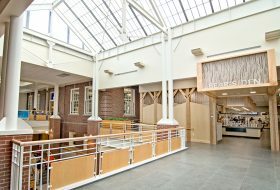 After gutting the entire dining commons, the renovated dining hall increased the number of seats from 550 to 766, increased the number of ventilation hoods from three to seven and add several newly-branded serving concepts – including a taco bar (heavily requested by students) – bringing the total to seven. The project’s greatest challenge would be to overcome the very short deadline. According to Kris Morphis of Foodesign Associates, the foodservice consultant was hired just six months prior to the projected completion date and the beginning of the fall semester with no construction even underway yet. Dixie Store Fixtures and Sales Co, Inc, out of Birmingham, Alabama was chosen as the kitchen equipment contractor for the project and was responsible for bringing in LTI as an equipment manufacturer and installer. Dixie has a long-standing relationship and experience with LTI on large profile type projects including the Georgia Dome, Olympic Stadium and its conversion to the Braves’ home stadium, as well as several others. Dixie’s president Fred Cypress and project manager Sue Cole ran the Lakeside Dining Hall renovation with the LTI team. LTI worked together with Dixie through the entire manufacturing process, from making site visits for field measurements and template fittings to communication with the project’s teams for upfront coordination, ensuring a proper installation that would meet quality expectations. 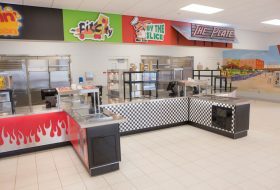 LTI’s contributions to the project included manufacturing of the top-quality, custom-configured equipment that would be used in the first floor serving stations and providing turnkey installation of that equipment. The portions of the design that feature LTI’s work included a centrally-stationed serving counter built to a 55-foot by 38-foot specification. The outer edge of the 55-foot side was radiused and abutted six structural columns. The customer facing side of the counter features four different décor styles, all provided by LTI. Because of the size of this stainless steel counter, it required being shipped in 12 pieces. Despite the opportunities for error that were brought on by the sheer size of the counter and its specific alignment with the six columns, the installation and fit of the counter was flawless. Morphis said that the consultant’s longstanding relationship with LTI as a manufacturer, the ease of working with them, the manufacturer’s regional proximity to the project and their quality manufacturing practices all contributed to LTI being awarded the project. Between good communication and properly-managed expectations, equipment was delivered on schedule and LTI crews remained onsite to install all equipment until the job was complete. 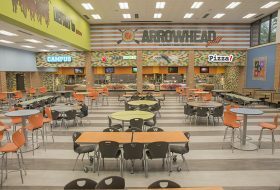 Though the project experienced some scheduling challenges, the renovation was completed on time and able to open for the beginning of the school year. 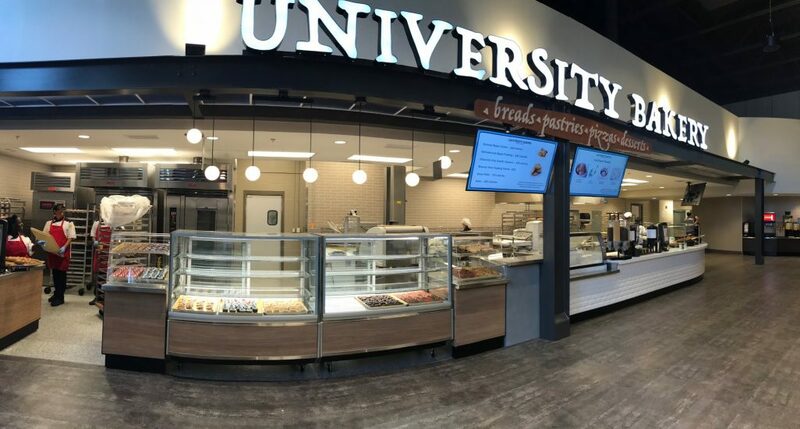 The university has since reported to Morphis and his team that not only has there been an increase in student dining plans due to the renovation, but there has also been a large increase in faculty and staff dining plans. 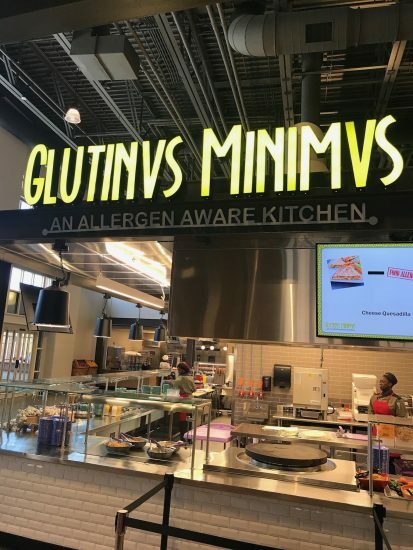 The serving and dining options have given the non-student group an added amount of dining flexibility and has made it more convenient for them to remain on campus, leading to great food sales for the university. can help design and create food serving equipment to meet your goals. We're changing how food is served. All rights reserved © 2019 LTI, INC.
You'll find a tailored experience depending on your role with the foodservice design team. We've streamlined menus and incorporated a robust gallery to give you an idea of the quality and range of craftmanship we're capable of producing to meet your food service equipment goals. You are leaving lowtempind.com to visit cafeteriarescue.com, where you can learn more about our successful work with K-12 clients.